Petrochemical companies and other companies throughout the world use North American-Nutron specialized and high quality products in both upstream and downstream applications. North American-Nutron products can be manufactured from forged carbon and stainless steel, duplex steel, inconel, monel and other alloys. North American-Nutron takes pride in it's products whether they are "off the shelf" or require "special handling" in design and manufacture. Our service excels in the industry primarily due to its design, engineering and assembly teams supported by an extremely qualified and highly trained staff. 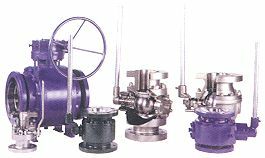 Cast Steel Gate, Globe and Check Valves We have a wide range of valve and choke products to meet the demands of today's rapidly changing technological age.